Plastering is one of those things that can often go unnoticed but without it we wouldn’t have the smooth walls and ceilings that we...err...take for granted (or just never really thought about until right now). However, this ignorance underlines how important it is and how in demand those trained in this trade are within the construction industry. Plus, plastering isn’t all smoothing out walls and ceilings – in fact, plasterers are the ones responsible for the beautiful cornice work you’ll find in many homes and public places, not only applying it but designing and making the moulds too. So Joe, can you tell us a bit about how you came to be where you are today? I started as a 16 year old, I got an apprenticeship with the firm that my father worked with. It was a massive firm in central London and I did a four year apprenticeship there and it was a very big company so it showed you every aspect of plastering. I was there for six years before they shut that department. I started working for myself and did that for 18 years and then, getting older, as we do, I didn’t want to still be plastering. So I was looking for different jobs, a different avenue to go down. I saw an advert in the paper asking for advanced level plasterers and I just sent my CV off, not really knowing what it was about. I just thought, well let’s see what it is. Then eight months after that I got a call asking if I wanted to me a teacher. I was like, ‘Teaching? Me?’ because I didn’t even know the advert was to do with that. So I went down and had an interview and they said, ‘Do you think you could do it?’ And I really didn’t know. So they put me in front of the class with a group of students and I found I was confident enough to speak about plastering in front of other people. I got offered the job and was there for two years. I left when they closed down the plastering department and so I applied for the job at Able Skills where I am now and I’ve been here for five years. That’s my career path. I’ve worked in domestic properties, I’ve worked on site, I’ve worked on refurbishments in prisons, I’ve done all sorts! You’ve got a lot to share with your students then? Yes, well that’s the thing, because I learnt so much as an apprentice, there aren’t many plasterers out there who have done as much as I’ve done. I’ve learnt how to do all sorts of different solid plastering, I’ve learnt to do floors, walls and I can also make and fit the cornice plaster, the fibrous plaster, the specialist stuff. I’ve got a vast array of knowledge and I’ve been doing it for 35 years, so I thought, yeah I could teach this. And it’s nice, every week is different, every student is different and as long as you can relay something to them, it’s brilliant. It must be nice to have become an expert in your field and then be able to pass that on? Yeah, because plastering is a very physical trade and eventually when you do get older you’re just like wow, I don’t want to do that anymore. It’s probably like running marathons; you can only do it for so many years. What is it that you really enjoy about plastering? It’s an intriguing thing. It’s like fitness, you get a buzz from it – maybe it actually is because it’s such hard work physically. And because it’s a finish trade, you actually see the finished product. You see a room transformed from nothing into ‘Oh, that looks nice!’ – actually achieving it, especially in domestic premises where people actually see their rooms come good, it’s rewarding. I mean, site work, it’s a bit daunting really because you generally never see the last little stages. In domestic though, you actually see it. It’s nice seeing people’s faces when it’s like, ‘Wow, now I can see my room coming together!’ The cornice work, the fibrous plaster, that’s even more rewarding. It’s something different completely. It’s an art and it’s where you get to use your imagination. What do you think is the hardest thing about plastering to grasp? What do people find difficult to master? The actual physical part. The thing is, you have to apply strength to it. You’ve got to have a delicate feeling in your hand but you have to have physical strength. I mean, we have all types – from 16 year olds to 60 year olds – and you can never tell who’s going to get it or not. I’ve had body builders struggle with the physical side. It’s a different kind of strength. It’s an odd thing to explain; you’ve got to be strong and physical with it but also so delicate. And how much of it is creativity and how much is skill? Do you think there’s a balance in plastering between the two? Yes, when it comes to cornice work definitely. There’s two step to it. First is where you actually make the cornice – you’re actually designing it, you’re making little roses and you’re joining it all together, you’re actually doing it freehand. Then you make a mould of that and you cast it off which is when when it comes to a more repetitive motion. There’s definitely a balance. I mean, you do get the roughy toughies turn up like, ‘Yeah I wanna be a plasterer,’ then they get on the plastering and they’re too vicious with it. You’ve got to have feeling in your fingers. Plastering is quite a male-dominated industry – do you have any advice for women that might want to get into it but perhaps feel a bit unsure? I’d just say have a go at it! 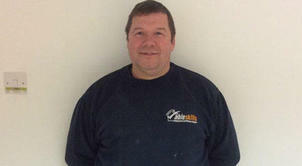 We have had six or seven women come through our course that have gone on to be plasterers. I’ve found women to be easier to teach than men – they follow instructions better! So can you tell us a bit about the courses you run? We do loads, from one week hands-on courses to learn a bit of a trade, to longer courses where they can get qualified. This is the City and Guilds training which will mean they can go straight in the industry. We usually advise people to get a bit of experience when they’re finished as well, whether with a local builder or a bigger company. What would you say has been the highlight of your own career so far? I’ve worked in loads of major hotels in London – I did the cornice work in the Ritz! I did a whole hotel in the 80s; the Berners Hotel (now called The London Edition). If you’re ever in London, near Tottenham Court Road, ask if you can go in and see the ceilings. It’s absolutely beautiful! My dad made all the material that went up there and then I fitted it. I’ve also done the Dorchester Hotel ballroom floor, but probably the Berners Hotel one is the one I’m proud of. Especially doing it with my dad, and the other bloke I worked with there was the one who taught my father; he was in his 70s! It was a really special job. There is lots of traditional stuff as well as some modern stuff. They wanted to keep the traditional ceiling but modernise what was underneath it. With a reputation like that, do you get called upon by friends and family to do jobs round the house? Course I do! You feel obliged to go and do it but you also feel obliged to not charge them as well! Last year, my brother, he’s got a listed building for his house from the 1500s, and the back wall fell off. So the middle of last year, I got called to have a look at it and got conned into doing it by my dad and my brother and all three of us put this wall back on, but we had to do it in the traditional way. So there was horse hair, cows’ hair, we had to have the right ratio of lime and it was all done absolutely to the letter of how they did it back then. It was quite physical but interesting. Yeah, well I said to my brother, 20 years ago I might have enjoyed doing it, but not now! Because it was hard! Ok, well on that theme, have you got any DIY blunders that you’d like to confess to us right now? Well I’m not the best of brick layers...but I always say that’s ok because I can cover it over with plaster! That’s handy then! So my last question, do you have any words of wisdom for anyone considering becoming a plasterer? If you go for it, try and take in all aspects of plastering if you can. It’s so enjoyable. You’ve got to be physical but if you’re willing to work for it, there’s plenty out there. Even people who can’t do massive amounts, there’s always someone who will want their wall done or their ceiling done. People get into the thinking of ‘Oh I’ve got to go on site, I’ve got to go on site.’ But there are millions more houses out there. There’s more work domestically and once you’ve got a name for yourself, that’s it. I worked 18 years self employed and I had to advertise for the first two years but I never had to after that. It’s just word of mouth. So yeah, just go for it! It’s a great trade to go into! If it’s a trade you’d like to go into and Joe has inspired you to learn more, have a look at the plastering courses listed here. Now I’m off to check out this hotel!